Ok, i have finally completed a tool for the Oric called CBM. It is based around the AIC graphic technique used in games such as Stormlord and Impossible Mission. The construction of most Platform games consists of Characters, Blocks and Maps (hence CBM). On platforms other than the Oric, up to 256 Characters may be freed for use in games. 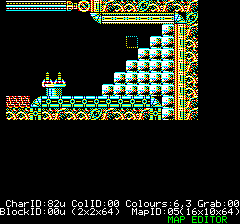 However the Oric only permits up to 96 characters in text mode and none in HIRES. So Characters in HIRES are software driven only. In CBM they are 6 by 6 pixels and there are 256 available). to be duplicated. Blocks can be from 2 by 2 to 8 by 8 characters and up to 256 of them. Maps are arenas or screens that hold blocks. Below is the Files screen, the first screen you will see, showing the current map dimensions, memory usage and files options. 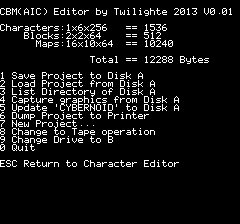 Below are the Block and Character Editor environments (with the Cybernoid project loaded) with the Character editor at the top and Block editor centre. Next is the converted graphics from Cybernoid. It is much better with AIC to use original graphics but then alot more work. 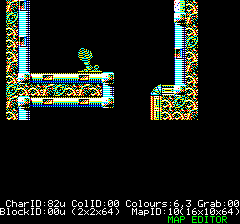 Converted graphics may then be captured directly as blocks in CBM which may then be used in the map. 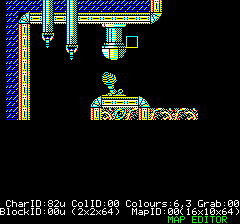 Next are some of Cybernoid Level3 screens reconstructed in the map editor in CBM. The software is currently in beta testing but will be released soon. Last edited by Twilighte on Sun Feb 17, 2013 4:40 pm, edited 3 times in total. That seems very promising indeed! However, I cannot see any of the pics you posted. Maybe a broken link? With the Block capture feature i haven't needed to edit any individual character which has reduced a lot of work. The block capture facility also scans the existing character set for duplicates so saving more characters and memory. I can release the following 0.001 version. I've tested it myself, through adhoc testing and also by developing the test example Cybernoid. A spanish friend of mine has also tested it a bit. Please note this program will only work on the Oric Atmos with ROM 1.1 and Sedoric Disk. Please note from within the Character, Block and Map Editor press Ctrl H for key help. For the Capture utility, cursor keys to navigate, ZX/' to change size, U to change units, Ret to capture and Esc to quit. 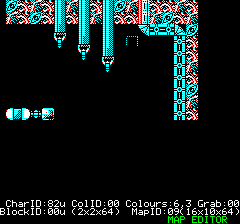 What a great tool to release this year, when there's a little more focus the Oric. I certainly have a use for it, I've been tinkering with 6x6 graphics and this may well make things much easier for me. Amazing! You did it again, Twilighte! This is a reason for me to have my Oric rig permanently set up again .. I think this moves us one step back into being able to use an Oric exclusively to develop code again, onboard-style, right?